My work focuses on architecture and the urban environment. I spend a lot of time drawing on location. I look for strong architectural shapes and compositions and take inspiration from my home city of Edinburgh. The larger paintings develop from ideas in my sketchbooks and are built up over time with layers of collage, acrylic paint and ink. The smaller pieces are often taken directly from my sketchbooks. I find the process of arranging papers and surfaces combined with painting and drawing very liberating and it drives the direction of my work. Born in 1974, I studied law at Edinburgh University and qualified as a solicitor in 2000. I worked in private practice for nine years before taking a break to start a family. 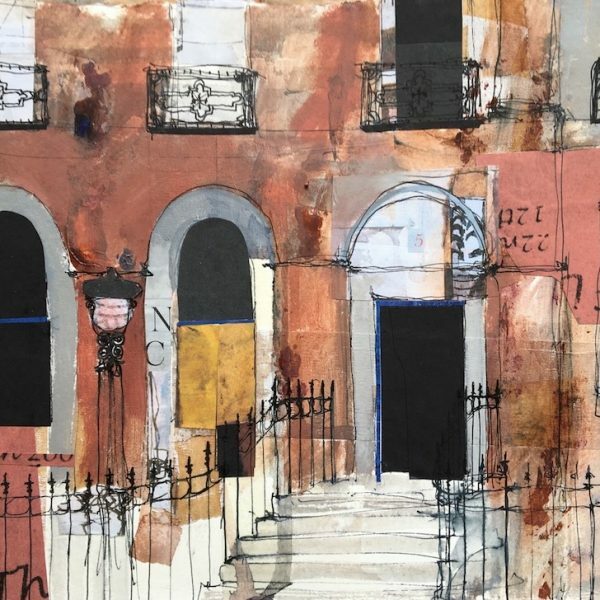 Instead of returning to the legal profession, I decided to pursue my interest in art and from 2011 I studied three short courses at Edinburgh College of Art covering landscape, cityscape and mixed media. Since then, I have worked full time as an artist and have exhibited in a range of group exhibitions and have had two solo shows at The Open Eye Gallery in Edinburgh.